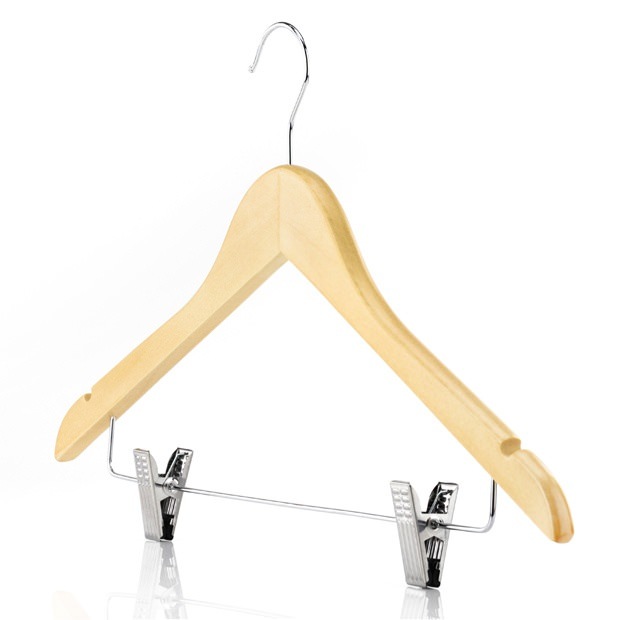 Superb quality clip hangers manufactured from strong maple wood, with a natural, varnished finish for an understated, classic appearance to suit any surrounding. The smooth surface prevents your clothes from being snagged, which can cause loose threads and quicken the deterioration of your garments. Shoulder notches allow you to effortlessly hang clothes that have garment loops and straps, without them sliding off. Two adjustable width waistband clips, with soft, rubber lined jaws that will provide a secure hold, but wont leave marks or dimples at the place of attachment. Completed with a chrome, 360° swivel hook that allows you to position the hanger in any direction, and neatly align your clothes. Excellent combination hanger that enables you to hang tops, t-shirts, shirts, blouses, jackets, coats, dresses, suits, and of course, trousers and skirts, with one highly practical, all-purpose hanger. This is a quality product, space saving as you can hang jackets along with skirts or trousers . Quick delivery. Nice hangers, the waistband clips are lined with rubber so they don't dig into the fabric. Happy with my purchase.